SITCON is a project financed by Agence Nationale de la Recherche in Systems Biology program. Many human cancers arise through the alteration of transcription factors (TF) generated by specific genetic rearrangements. In most adult cancers, these alterations frequently involve multiple TF and are associated with abnormalities of other signal transduction molecules. This complexity hampers the precise delineation of the respective role of these rearrangements in the tumorigenic process. The genetic profile of pediatric tumors is usually much more simple with one or few key genetic events being clearly responsible for tumor development. For understanding the complex picture of deregulations happening in cancer cells it is crucially important to have relatively simple cellular models in which one can perform stably reproducible experiments in the controlled environment. Having such a system and collecting sufficient amount of experimental data on all aspects of the system functioning we can hope to obtain insights into how the cell becomes malignant and how to control this process. Methods of systems biology promise us to accelerate this process and, moreover, propose new directions and experimental designs. The Ewing inducible cellular model developed by one of the partners of the project is an excellent object for such a study. 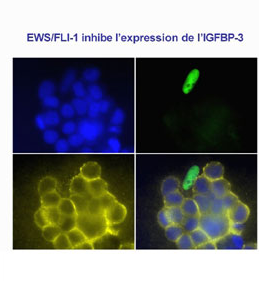 This human tumor cell line is characterized by a malignant genomic translocation and appearance of a chimeric gene EWS/FLI-1 whose activity leads to the uncontrolled cell growth. 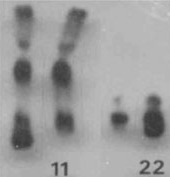 It was possible to design a system in which this chimeric gene can be effectively silenced and switched on back, resulting in arresting and launching cell proliferation. Thus the expression of the only gene changes cell phenotype from tumorigenic to the normal one in fully reversible and controlled manner. However, the biological mechanisms by which the expression of this oncogene regulates cell proliferation remain unclear. To study them, a comprehensive corpus of data including results of genomic, transcriptome (time-series and steady state measurements), ChIP-on-chip arrays and microRNA expression data, is already collected for this system and the new data will be available in the following year. This combination of a relatively simple (monogenic effect) system, available data on many aspects of the system functioning and already established tight interdisciplinary collaboration between bioinfomaticians, mathematicians and biologists creates the most favorable conditions for successful and sound systems biology project. Use modeling to propose new experiments in order to validate and improve the constructed models and perform these experiments. To achieve these goals we propose a combination of complementary systems biology approaches: network inference and pathway scoring and the original qualitative network modelling. The project involves an interdisciplinary partnership of four teams with complementary expertise in molecular cancer pathologies, high-throughput post-genomics data production, bioinformatics, data integration, network inference and modeling. The project is divided into five workpackages. The first workpackage is an experimental one and it will consist in collecting more data required for validation of model predictions as well as developing the inducible Ewing cellular model and creating an alternative cellular model in which the oncogene will be introduced in the normal counterpart of the Ewing cell. In workpackage 2, a relatively small network connecting the oncogenic protein and cell cycle and apoptotic modules will be inferred from data using combination and integration of existing approaches together with use of heterogeneous sources of data. The network scaffold will be curated by experts. 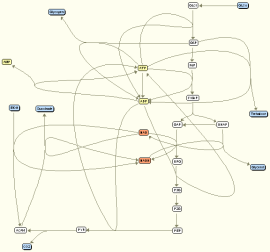 Workpackage 3 is devoted to pathway scoring using a set of complementary statistical techniques allowing to detect perturbed pathways and network modules. The fourth workpackage will be devoted to the qualitative modeling, an original technique developed by the partners of the project, of the network outlined in the WP2 and WP3. 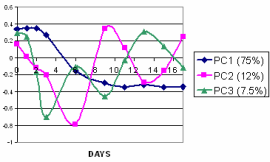 The result of the modeling will be a graphical model qualitatively compatible with available data. The fifth workpackage Is an analytical one in which both experimentalists and theoreticians will work on designing new optimized experimental protocols which will validate and improve created models. On the experimental side the project will deliver a new cellular model with Ewing progenitor cells. New experimental data will be collected including high-throughput data and time-series. On the systems biology side, we provide a qualitative model of how the expression of the only oncogene regulates cell proliferation and apoptosis in the Ewing inducible system. New mathematical methods and software tools will be created performing analysis and inference of biological networks from heterogeneous sources of data.